I spotted this couple and saw the picture I wanted to take. After a couple of shots I realised I probably looked like a stalker especially when I saw a group of men watching me. Yikes, I quickly scooted off in the other direction. I thought it would make a picture that could have been taken many years ago. What do you think? I think the same. The woman dressed very classic and I like the wind in the coat of the man. Absolutely it is timeless. 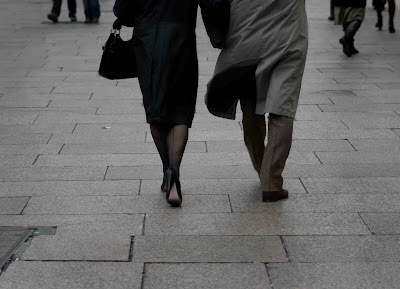 Love her high heels and his topcoat! Perfect. Sometimes you just need to STALK! Well done. LOVE it. I imagine them both wearing stylish hats....her hat is red atop a head of wavy hair and his is brown with a black band, maybe. Nice work Mo! This is a timeless photograph. I am so intimidated by street photography. I think this pick has inspired me! Yes, I think you're right. It reminds me of the 40's or 50's! Also, just wanted you to know that you won an award on my blog today! Enjoy! Yes. The backseam stockings put this image squarely in the 1940s or 50s. Good eye! My thought when I first saw the picture is "this could be from the1940's". Then I read you comments. Yes, I think you accomplished your goal beautifully. I do like this photo. Some things are indeed timeless. excellent candid. totally love it. well done. Wow - definitely. That shot reminds me of an old Audrey Hepburn movie or black and white film footage of London back in the 50s. I would have asked them to pose for a photo. It does look like an image from an earlier era. Like you, I'm awkward about taking photos of strangers. It's very hard! Absolute 100% classic. It looks very Parisian. I adore this shot. Hi! I'm from Argentina, but I'm a big London fan, I dream to go there someday and your blog is definitely making me want it sooo bad! I wasn't so decided to comment in here until I saw this pic for the second time. I like it so much! The colour of it, the fact that you only see half of the bodies and the way they dress, it just makes it gorgeous. If I hadn't read what you wrote I would've thought you set it up! Oh, and I admire you for daring taking stalking pictures :P I can't do that yet, I have to find courage hahaha.